painting and parties out of the way i’m beginning to ease back into the crafting and blogging swing of things, it feels so good to pick up a crochet hook again. 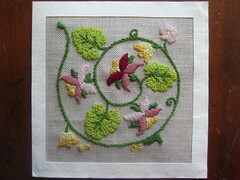 i did manage to squeeze in a little stitching over the past few weeks, for mother’s day. to save time in the hectic run up to mothers day i thought i’d go with a kit, from the v&a. it was designed as a pincushion, but i (rather sloppily) mounted it onto a card. i really enjoyed working it, it had a similar appeal to my perfectionist tendencies as blackwork, but rather more laid back. you don’t have to count threads exactly, just make sure you cover the areas solidly. it should be easy enough to work any design of your own choosing, the 3 stitches used in the kit (satin, long and short, stem), look as though they would cover most bases. the kit was marked advanced, but it was very straightforward and fairly quick too. on the down side mum hates fuschias, and i knew that when i got the kit, but i hoped the time and care that went into working it might make up for that. it was the only small crewel kit in the shop - and i do think it’s pretty. there was a much nicer one pictured on the packet from the same series of an alium or somesuch but they didn’t have that one.